by Christian Eckart. Oxford and Portland Oregon: Hart Publishing, 2012. 356pp. Cloth $146.00/ £70.00 ISBN 9781849462327. It is well recognized that declarations made by way of unilateral acts, concerning legal or factual situations, may have the effect of creating legal obligations. Declarations of this kind may be, and often are, very specific. When it is the intention of the State making the declaration that it should become bound according to its terms, that intention confers on the declaration the character of a legal undertaking, the State being thenceforth legally required to follow a course of conduct consistent with the declaration. An undertaking of this kind, if given publicly, and with an intent to be bound, even though not made within the context of international negotiations, is binding. In these circumstances, nothing in the nature of a quid pro quo nor any subsequent acceptance of the declaration, nor even any reply or reaction from other States, is required for the declaration to take effect, since such a requirement would be inconsistent with the strictly unilateral nature of the juridical act by which the pronouncement by the state was made. Of course, not all unilateral acts imply obligation; but a State may choose to take up a certain position in relation to a particular matter with the intention of being bound - the intention is to be ascertained by interpretation of the act. When States make statements by which their freedom of action is to be limited, a restrictive interpretation is called for. This case arose, it will be remembered, when New Zealand and Australia sought assistance from the ICJ to prevent any further testing of nuclear weapons in the atmosphere in the Pacific region. The Court determined that judgment on the issue was unnecessary as French officials had announced that there was to be no further atmospheric testing and France was consequently bound by the pronouncement. Even when the Court’s decision was given, most writers and international [*65] lawyers realized that the deceptively simple paragraphs quoted above would be far from the last word on the matter. No clear guidance was provided to distinguish which statements or actions of a state would bind it in the future. Nor was there any indication of the duration of any undertaking, nor as to how such undertakings might be modified or withdrawn. Additionally if intention is to be ascertained by interpretation of the actions or words emanating from the state, who is to be the arbiter? What is inferred might not be what was meant to be implied. Although the Nuclear Tests cases were not the first to suggest the possibility of unilaterally binding actions or words (previous discussion of the question is usefully identified by Eckart), it was these cases that persuaded the International Law Commission to put the topic ‘Unilateral Acts of States’ on its agenda and work began in 1996. It quickly became apparent that the subject was much more complex than had been anticipated. After ten years, restricting itself to a consideration of declarations rather than acts, the ILC concluded its work by suggesting ten ‘Guiding Principles applicable to Unilateral Declarations of States Capable of Creating Legal Obligations’. It has to be said that these Guiding Principles do not add as much as might have been expected to the words of the ICJ. As an example, concerning the question of revocation of such unilateral statements, Guiding Principle 10 simply suggests that unilateral declarations may not be revoked ‘arbitrarily’. 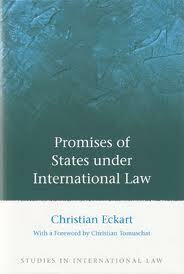 It is the recognition of the shortcomings of the ILC’s conclusions that provide the impetus for Christopher Eckart’s book. For very good reasons he too confines his consideration to unilateral declarations (to have considered in addition actions other than declarations would have required at least a second volume). If the final result remains also within the realm of ‘guiding principles’ this is a reasoned reflection of the immense complexity of the subject which arises from the vast myriad of cases that have little in common beyond a unilateral declaration that may or may not be capable of creating legal obligations. My own conclusion is that this fact implies that Eckart has gone about as far as he could go. His contribution here (and it is a significant one) is to have isolated and enumerated the different sorts of unilateral declarations, the different circumstances that have led to them, the different implications of regarding them as creating legal obligations, and the different implications in the decision as to whether, and if so when such declarations can be withdrawn. Surprisingly this Declaration finds no place in the very useful second chapter and Annex exemplifying state practice on this question since the founding of the League of Nations. Other examples apart from the French Declaration on atmospheric nuclear tests, include the Declaration of Independence by Kosovo (which obviously lacked the recognition from many states necessary for bilateral agreements) and this included undertakings consistent with human rights law, and the Egyptian Declaration on the Suez Canal after the Suez crisis of 1957 which, although unilateral was actually deposited and registered with the Secretariat of the United Nations under Article 102 of the United Nations Charter. It is also suggested that one motive for the ‘declaration process’ might be to effectively bind the hands of subsequent governments. Just as treaties ordinarily continue to bind successor governments, so it is suggested might such declarations. This however remains contested and again will probably depend upon the intention of the making government as reasonably inferred by a state seeking to rely upon the declaration. As will be apparent from the above this is clearly a book on a significant topic in international law. Eckart generally provides a careful analysis of a mélange of cases often very different from each other, but this does mean that the drawing of precise and concise conclusions is neither attempted nor possible. This is an inevitable shortcoming. Less inevitable and therefore more unfortunate, is the omission of a discussion of the effect of states purporting to withdraw from unilateral promises. Certainly this is mentioned in relation to the attempt in 1984 by the United States when faced with action by Nicaragua, to immediately modify a declaration, but more widely the question of any remedy in the event of a state resiling from a declaration relied upon by another state or other states is not considered. Of course in some cases this might be a matter of relevance to a case brought before the ICJ but even this depends upon that Court having jurisdiction. A final comment. This is a superbly produced and edited book (as well it might be at the price) and it is elegantly written. Unfortunately the index is inadequate and to navigate to pages or topics it is necessary to constantly use the Table of Contents, with all the inefficiency that this brings. There are simply too few words and topics indexed and even where they are there is a complete paucity of detail. Copyright 2013 by the author, Wade Mansell.